I think I needed a day filled with joy. Not one that required too much mental stamina. Monday fit the bill. That list doesn’t even include the normal day-to-day events. And you know what? It was an amazing day. I love parent-teacher conference time. I drag it out for a week instead of our two days, meeting parents before and after school as well as our two nights devoted to them. I love talking to parents, getting feedback, and just getting to know families a bit better. Our field trip is one of my favorites – to a nearby town where they have an amazing local theater. Today’s show was a live performance of Schoolhouse Rock. It was awesome. And the ride there and back was as quiet as any field trip I’ve ever been on – so many kids had books with them. I finished Port Chicago 50 and got the chance to book talk it to all of the students near my seat. All of these kids brought books. Love them! Finally, my principal rocks. My son’s sixth grade language arts teacher had sent out a request for parent helpers. They’ve finished their memoir unit and she wanted them to read their writing in groups for feedback. My principal agreed to take my class for their independent reading time while I ran across town and volunteered. Loved it! The kids have grown so much since last year. I was hugged numerous times by my former kids. I miss them so. And their writing? It rocked. I’m so glad to see them flourishing in middle school. The awesome sixth graders I got to read with! What a way to start of the week! I read aloud to my students every day. We devour a stead diet of articles, picture books, long chapter books, and short ones. I don’t consider a day of teaching complete unless I have read aloud. In my own reading life, I often read books wondering if they will make a good read aloud. There are a lot of books that make that list – good books to read aloud. Then there is another category – the great read alouds. This category is lined with the memories I have of those special read aloud books. Titles like The One and Only Ivan, Wonder, Mark of the Dragonfly, Bluebird, Charlotte’s Web, I Want My Hat Back. These books are wonderful in their own right, but when read aloud, magic happens. Recently, I found a new volume to add to this special category. 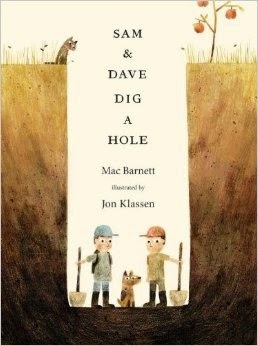 I knew Sam & Dave Dig a Hole by Mac Barnett and Jon Klassen was destined for greatness from the moment I began reading it. I loved the story, the illustrations, everything about it. Slowly, I began imagining this picture book as a read aloud. I was certain it would be a favorite. I thought, I knew, my fifth graders would enjoy it. I hadn’t anticipated, however, just how much they would. It was magic. When I brought this book into class, I knew I wanted to read it to each of my three language arts classes. I typically read aloud while we are seated on the carpet. Because of the illustrations in this one, I wanted to read it under the document camera as well. I felt like the kids needed to see the illustrations up close. These fifth graders shed their pre-teen personas and became the kids they once were, that they truly still are deep down. Eagerly awaiting each page turn, they begged me to hurry so we could find out what happens next. I am not one to spoil the book, so I will simply say that the end left them silent and then, at once, full of questions and predictions. We flipped from the first page to the last several times to gain what little insight we could into the final events of the story. I know some teachers believe picture books are best left for the younger grades. I simply don’t understand that mindset. Picture books come with no age restrictions. They are the perfect text to share whether you are one or one hundred and one. And a great read aloud? It knows no age limit either. Sam & Dave Dig a Hole belongs in the read aloud hall of fame. How about you? Do you have a favorite read aloud? Please share in the comments. Tonight I have sat and stared at my computer, struggling to put words together. I need to celebrate this week, but I feel like doing anything but celebrating. It’s been a tough week, full of challenges, grouchy moods, disappointing news, and so many reasons to feel let down. I have struggled, questioning friendships, career choices, priorities, and more. Snapping at my boys, I try and reel it in and remember what is good, what needs to be celebrated. A shift of focus is needed, especially when one’s plate is overflowing. I celebrate the app Voxer. How it allows me to hear my beautiful friends’ voices, even when they live so far away. I celebrate attending Luke’s first middle school concert and marveling at how they have grown in just a years time. I celebrate former teachers, like Ms. Flock, and their willingness to give me a grammar lesson so I can help my own child with their homework. I celebrate Liam finding a new book series he adores – The Imaginary Veterinary – and am grateful he is enjoying it so. I celebrate my students and their excitement to attend our book fair. I celebrate canvassing the town with a friend all morning. The opportunity to walk and talk for three hours was wonderful. I celebrate my community. While some folks are very against the referendum and might be angry about it, I have had positive interactions for the past two Saturdays with people choosing to vote yes or no for our school referendum. I’ve loved the opportunity to visit with people I know and get to know some I haven’t met. While time consuming, it has started my Saturdays with a smile. I celebrate stolen time. I’ve been trying to read The Red Pencil for at least a week. My schedule is a bit of a headache right now and reading time has taken a hit. Today I stole an hour – my car was getting an oil change and I had time to myself in the waiting room. I finished that beautiful book and am so glad I did. I celebrate getting the chance to talk to Luke and realize how mature he is becoming. I celebrate that I like my own children and truly want to spend time with them. I celebrate another former student giving Liam a pair of black sweat pants just like his and coming to deliver them to him. Liam was a bit star struck. I celebrate time. Time to pray, time to reflect, and the gift of time I am given. Tonight as I drove home from all of my errands in Champaign, I watched a beautiful sunset. My heart was heavy as I thought of a former student. Her mom has lung cancer and is in the hospital. I chose to take my drive home and pray for the family. I can’t do much, and that makes me feel powerless, but I can pray. If you are so inclined, please say a prayer for my beautiful student, Cansas, and her mom Pam. She is a wonderful woman who absolutely deserves more time with her children too. It has been a tough week, but when reflecting, it has been filled with tiny celebrations. I’m grateful for this weekly post to remind me to search out the good, it is always there. I’ve been struggling of late. It began at the start of the school year, before it even began. I watched friends I teach with get ready and was shocked that they had so much energy! They were talking about everything they had done since the end of the previous year. They seemed ready to start anew with a bounce in their step and a smile on their face. I looked at them with envy. I had anything but a bounce – I did have a smile. In fact, I felt a strong connection to Atlas. I was weighed down. 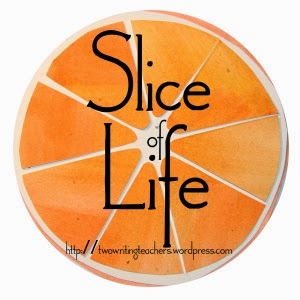 Read 10-15 blogs a day so I can share them for Choice Literacy and myself. Schedule the Nerdy Book Club post for Mondays, Fridays, and Saturdays. Write for my own blog. This year I added to that pile. I agreed to co-chair a canvassing committee for our local referendum and teach CCD for my oldest son’s class at our church on Sundays. Oh, yes, and I also wanted – and was trying – to write a book. Beyond that, I am a mom to two amazing boys with two very full sports schedules. The school year began. My students are AMAZING. My stress increased. This year we combined reading and writing into one class – language arts. Previously I taught three sections of reading, one section of writing. Now I taught three classes each day – but all of that previous content needed to squeeze into those three classes. I added on teaching our gifted students. It hasn’t been pretty. I know myself. I say yes to too much, but not to myself. I want to help everyone, and can end up helping no one. It is frustrating. I can look at the list I typed above, know that I take on too much, but also know there isn’t one thing I would want to give up. I don’t have any answers. The world I am trying to hold up on my shoulders has not gotten any lighter, and I don’t anticipate that happening anytime soon. What I have gained is some perspective on what my purpose is, which I think helps. Yesterday I went door to door for three hours in our tiny town. My brother came with me, desperate for folks to canvass, I had asked him. It meant the world to me that he came. (Thanks, Ryan!) I wondered what it would be like – would people be angry? Would they be kind? It was enlightening. Many people weren’t home, which is to be expected. Some don’t answer their doors, which I understand. But I got to talk to so many people. People who thanked me for doing this work. I left my shift grateful that I had been given the opportunity to reach out to my community, to help in some small way. Watching others come back to report on their shifts, I saw that they had similar experiences. It made me excited to go out again next weekend. I really don’t have any huge words of wisdom here, or any great insights into the life as a teacher. Mainly, I wanted to reach out today to any of you who are also struggling – whether it is because you are trying to do so much like I am, or for your own reasons. I think sometimes I forget to look at the bigger picture and realize that I am doing some good. The day-to-day craziness overtakes me and I feel weighed down. This weekend I have tried to step back and see my purpose, and that helps. Now you know why I haven’t posted as much as I normally would. I’m trying to regain a bit of balance, which means some things have shifted to the back burner. Writing, unfortunately, has been one. Reading Ruth’s post yesterday (HERE) has reminded me that I need to pull it back in, and I will, but right now I am headed on a walk. I think that is where I must begin.